Two men have now been charged in the murders of 4 Bucks County men gone missing last week. 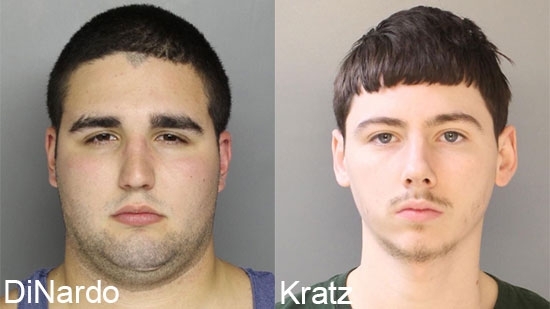 20-year-old Cosmo DiNardo of Bensalem, who has been a person-of-interest in the case all week, and his cousin, 20-year-old Sean Kratz, are accused of killing Jimi Patrick, Tom Meo, Mark Sturgis and Dean Finocchiaro at the DiNardo farm at 6071 Lower York Road in Solebury. DiNardo is charged with four counts each of criminal homicide, conspiracy to commit criminal homicide and abuse of a corpse. He also faces three counts of robbery. Kratz is charged with three counts each of criminal homicide, conspiracy to commit criminal homicide, abuse of a corpse, and robbery. According to his lawyer, DiNardo has confessed to the crimes to avoid the death penalty. The Bucks County District Attorney's Office released a detailed sequence of events this afternoon. Each of the crimes occurred on the farm in Solebury Township where the majority of the search has been focused this week. The murders started on July 5th when DiNardo shot Patrick during a marijuana transaction. He buried him in a shallow grave on the property. On July 7th, DiNardo and Kratz met Finocchiaro for a drug transaction and planned to rob him. Kratz shot him in the head and DiNardo shot him as he lay on the ground. Later on July 7th, the pair met Meo and Sturgis at nearby Peddler's Village. Sturgis left his car there and rode with Meo as they followed the cousins to the farm. When they got out of the car, DiNardo shot Meo in the back and then shot Sturgis as he tried to flee. DiNardo placed the three bodies (Finocchiaro, Meo, and Sturgis) in a metal tank. The next day, DiNardo and Kratz used a back hoe to dig a deep hole to bury the tank. They used gasoline to set them on fire. All four men have been recovered and positively identified. Family members were briefed this morning. You can read the Bucks County District Attorney's Statement here.